On my left arm, Fig Amere by Miller Harris. This is a unisex fragrance, with notes of bergamot, mandarin, narcissus, rose, fig, green violet leaves, angelica, cedar, sweet moss and amber. It starts very heady, but calms into an interesting mix of fig, florals (I am mostly smelling rose with a touch of violet), and an earthy-woody base with just a tiny bit of powder. 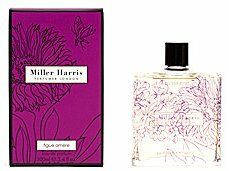 The Miller Harris line is interesting, and I love the bottle design, but so far none of the scents have inspired a purchase. Figue Amere is another close-but-no-cigar. It is just too sweet and rich for my taste — no surprise given the name — and I find the effect almost claustrophobic. On my right arm, Marc Jacobs for Men by Marc Jacobs. Although it is for men, to my nose it is no more masculine than many unisex fragrances on the market. The notes are bergamot, cypress, cumin, cardamom, ginger, fig leaves, rose de mai, cyclamen, tonka Bean, cedarwood, nirvanolide musk, fig, and patchouli. This fragrance has a strong note of fig over a woody base, and definite green notes. The cumin and patchouli, which are often deal-breakers for me, are thankfully subdued here. It is, however, considerably sweeter and more powdery than I expected, and as I am discovering, powdery fig is not my thing. A little postscript: a quick google search on nirvanolide musk reveals that it is a synthetic powdery musk created by Givaudan. Am I alone in preferring NOT to know the trade name of the synthetic used, or to even be reminded that the fragrance contains synthetics? I have seen Marc Jacobs for men like EVERYWHERE recently, but for some reason, I've never picked it up to smell it. After reading this, and now realizing it is a Fig scent, I will totally give it a try next time I see it (which, of course, now that I'm looking for it, I won't see it again for a while, lol). Weird coincidence…just saw the box yesterday, and it has fig leaves on it. Either they've re-done the box, or I've never seen it before. Yeah, I think that as a general rule the MH just doesn’t agree with me…there are only a few I like at all, I’m afraid. I just got a 2.5ml decant of Figue Amere on clearance at The Perfumed Court. I like it so far. I think I prefer Philosykos overall, but this one, since it’s a little richer and sweeter, with that little amberiness, might be my fall fig while I think of Philosykos as more spring/summer for me. I don’t really get violet in Figue Amere, which is fine for me as violet and I don’t particularly get along unless it’s pretty subtle. Actually, it really reminds me of Poison Apple Apothecary’s December Poison, if it had been alcohol-based instead of oil. I haven’t tried a lot from Miller Harris. I have tried and rather liked L’Air de Rien, but I also got Cuir d’Oranger in the same order as Figue Amere, and I’m a little disappointed in it. It’s really soapy to me throughout its development, and it strikes me as an abstract floral more than orange blossom, though I do get a hint of actual orange blossom later in its development. But I think if I want an orange blossom and leather scent, I prefer Cuir Venenum.